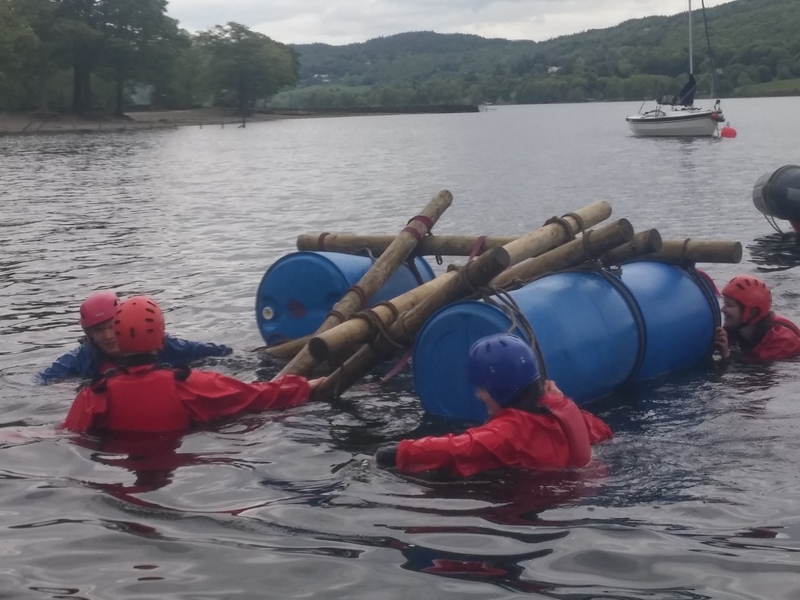 Two weeks ago, the first year students of LANS went on a four day residential trip to the Raymond Priestly Centre on the shore of Lake Coniston. 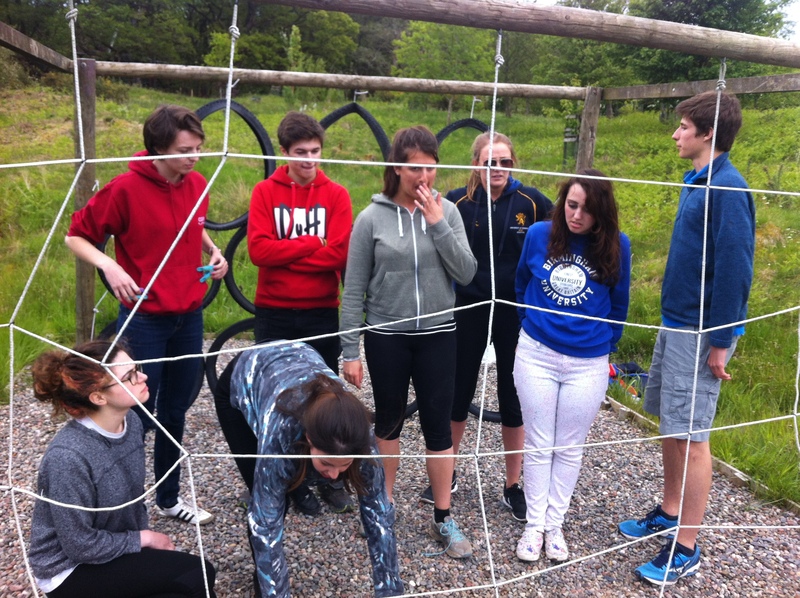 From hiking to high ropes, we took part in various activities designed to help us improve our teamwork and leadership skills – and were also very enjoyable! The good weather held for the majority of the week, meaning that evenings could be spent outside on the field and by the lake, or going to the local pub in the village of Coniston. After a 7am start in the North Gate Carpark, we set off to the Lake District on what looked to be a lovely day. Five and a half hours later, this proved to be correct as we arrived at the centre to blue skies. After lunch, it was outside to do some ‘ice-breaking activities’. These contests ranged from passing all members of the team through a hoop in 4 seconds, to racing a ball up and down the hill in sections of gutter; and by the end of the afternoon, all of the teams seemed to be really enjoying themselves. One activity involved passing a bean bag between two people stood on either side of an increasingly wide gap – this was attempted with varying amounts of success. On the second day, the teams split up to complete a circuit of activities individually. My group (Team 4), were on land for the morning. We had a rotation of activities: crate stacking, high ropes and low ropes, all of which were very entertaining! I think my favourite would have to be the high ropes, as it was a brilliant way for us all to work together and help each other through. Then, there was a fantastic lunch (quiche) before we set off for an afternoon of canoeing. While many canoes were off to a slightly rocky start, by the time we stopped for ice cream at the Bluebird café it was generally going swimmingly (not literally). Our third day was marked on the schedule as ‘activity day’, and so we had only a small idea of what to expect – other than we would need a packed lunch. Over the course of the day, we completed an orienteering trail, a logic puzzle, a hike and a canoe journey, gaining points for various correct answers during the day. While we were all exhausted by the end, the day was a success – I had a great time, and the views were amazing (even if we had to walk up a rather steep hill to get to them)! Plus, we succeeded in winning the prize at the end – ice cream! On our final day, we were able to choose our morning activity (mountain biking, sailing, gorge scrambling or kayaking). Having chosen sailing, my group spent the morning back out on the lake, which was great fun, and a perfect way to end the trip – especially the water fight with the group in kayaks! After a final lunch and a clean of the centre, it was back on the coach for the drive back to Birmingham. The trip was a resounding success, with everyone enjoying themselves, and it was awesome to be able to get to know everyone on the course. I hope that next year’s group will have as fantastic a time. On the final evening, we made a fire in the centre’s fire pit, around which we drank hot chocolate and attempted to roast a doughnut. Finally, on behalf of LAS Year 1, I would like to say a big thank you to everyone whose hard work made this trip a success. In Birmingham, I would like to say a special thank you to Ruth German, Ben Kotzee and Stewart Brown for organising the trip. I would also like to thank Ben and Stewart for accompanying us. Finally, I would like to say a massive thank you to all the staff at the Raymond Priestly Centre, who worked tirelessly to make sure we had a great time – everything was amazing, from the food, to the activities, and even to the atmosphere of the centre! The trip could not have gone ahead without any of you – thank you very much! Also, a personal thank you from me to Ben, Miriam and Lorna for allowing me to use their photos for this post! An insight into the process and motives which helped make a vision become reality. A blog entry by the Chair, Federico Stillitano (Liberal Arts and Sciences, 2nd year). If you were to ask any of my friends back in Italy, coming to study in Birmingham was quite an odd decision given that I am Italian. Indeed, most Italians choose London as their university (or work) destination. Unsurprisingly, this intensive migration has led London to become the sixth city by number of Italian inhabitants, surpassing cities like Florence, Venice, Verona and Parma. It might be London’s hectic nature, its uncompromising development, or the cocktail of culture which the city has to offer that might trigger the desire to live there. And although these characteristics greatly fascinate me, they have instead led me to choose a vast, green, campus-based university for my undergraduate years of study, knowing that I would then have the rest of my life to live and work in a massive global metropolis. Having made my decision I considered the fact that, like me, other Italians might also deviate from the apparent norm, and instead decide to go to other cities to study (one of these being Brum). I therefore joined the “University of Birmingham 2014-2015 Freshers” Facebook group, filtered its 5000 or so members by nationality, inputted Italy as native country, which resulted in a list of UoB Italian students, just like me. Once arrived at University, in between frenzied freshers’ parties and attempting to prepare productively my timetables and courses, I looked around the Freshers’ Society Fair for an Italian society stand, with no success. I in fact learnt that there had been a departmental Italian society in previous years, however it had just been closed. I therefore decided to make it my mission to re-start, and successfully run, a new, non-departmental society open to everyone, with the only requirement being an interest in Italian culture and customs. My first task was to fill in a society proposal; a 20 or so page document that asks the proposer to highlight the aims and philosophy of the proposed society. Considering that I had a clear idea of what I wanted the society to be, it wasn’t too challenging. In addition, I had to appoint a committee, which again wasn’t too hard, as at this stage I had met a few Italians and knew others from back home. Furthermore, to prove the society would target a proportion of students, I had to collect 20 signatures of people that would potentially become members and favoured the idea of an Italian society. After having collected, completed and sent the proposal and signatures to the Guild of Students, we were asked to pitch the society at a meeting (where again we stated the aims and philosophy of the group and why it should be officially recognised). Needless to say, the meeting was a success: within a month of having come to University I had managed to complete my first goal! Nevertheless I was aware that the hard part was yet to come: to recruit members and effectively run the society. I therefore went back to the list of Italians I had found on Facebook and individually messaged each person, pitching some small scale events we organised (like “aperitifs” and “meet&greets”), with the hope they would come, enjoy it and finally join. Together with the committee we started a Facebook page, spammed countless other Facebook pages, and managed to achieve a steady growth of likes. Indeed, at the time of writing the page has 182 likes. We chose the page as the main media with which we would communicate updates and future events to our members. Moreover, as a committee we decided we would never fail to pitch the society to any person which would show an interest to Italy during any conversation. This proved to be significantly effective, nevertheless we wanted to expand our membership base more rapidly and efficiently to organise bigger scale events. We therefore planned events targeted to any interest: cooking lessons, film screenings, football matches, Italian lessons and meals at home or in restaurants, with the scope of attracting the widest possible audience. And although we managed to organise a few of these events and did achieve a visible linear growth in participation, the majority of our ideas either clashed with other events, assignments or exams in the third term. This served us as a very valuable lesson, as it caused us to think of a number of procedures that would help us organise events more resourcefully next year. For instance, at our AGM we decided to appoint PR and Logistics managers. The former, being English, would demonstrate that the society is not limited to native Italians, but participation of “foreign” people is in fact encouraged, whilst the latter would help us effectively organise transportation and supplies for any event. Alongside fundraising and events managers, secretary, treasurer and chair, these new roles would be allocated specific tasks, in order to tackle every issue specifically and capably. With hindsight, although we could have done some things differently and maybe thought of solutions and methods of expanding our number of members in a more efficient way, we did manage to achieve a significant membership base and run the brand new society rather smoothly. I once read a quote attributed to American writer and lecturer Dale Carnegie, which stated: “People rarely succeed unless they have fun in what they are doing”. As a response I tend to find myself following this viewpoint in most things I do, as I believe that if you do not expect short or long term happiness, there is little reason to pursue any activity. Therefore while it might sound relatively irrelevant, my third and final aim was essentially to have fun setting up and managing the society: an aim which I can proudly say to have achieved! The whole process, although at times quite tedious due to the amount of bureaucracy and paper-work, was great fun: I learnt several important skills and really enjoyed all of the events, especially knowing that lots of hard work and determination led to something gratifying. As a matter of fact, I urge anyone to start a society, join a club, play for a sports team or just generally get involved: at the end of the day what you bring home from university, apart from what you learn in your degree, is what you do in your spare time. I cannot stress how important this is! 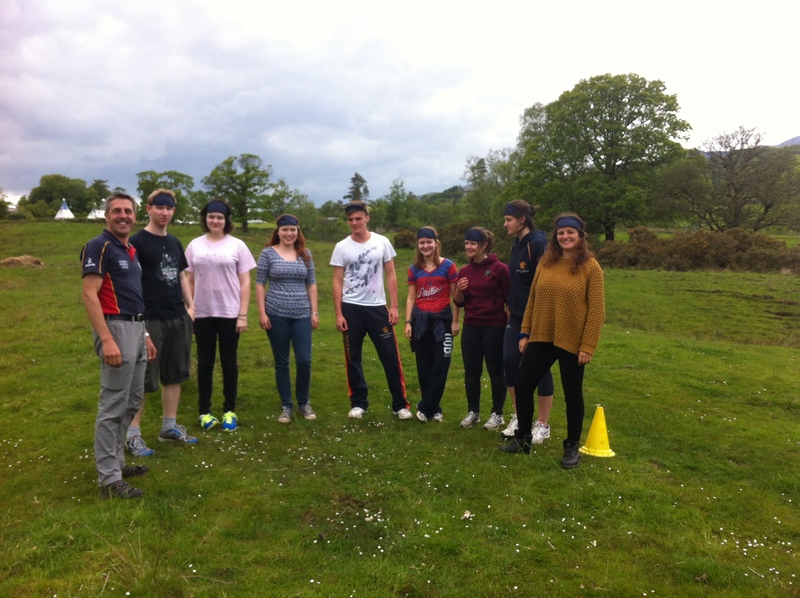 First year students on the Liberal Arts and Sciences programme took part in our annual adventurous training week at Coniston in the Lake District from Monday 8 to Thursday 11 June 2015. The University of Birmingham is lucky to have its very own outdoor activity centre, the Raymond Priestley Centre, on the western shore of Coniston Water. The Centre had its beginnings in the annual summer camps that the University of Birmingham set up at Coniston Water in the post-war years, and grew to comprise permanent accommodation and facilities. Today, the Raymond Priestley Centre offers students and staff the opportunity to take part in team-development and leadership courses, field-studies courses and training in sports and pursuits like sailing, canoeing, orienteering and climbing. The centre is named after Professor Sir Raymond Priestley (1886 – 1974) who was geologist on Shackleton’s expedition to the Antarctic in 1907–9 and Scott’s ill-fated expedition in 1910–13. He later became Vice-Chancellor of the University of Birmingham (1938 to 1952) and was a strong supporter of the educational benefit of adventure and exploration. Our gro up left Birmingham early (if not so bright) on Monday morning and arrived at the Priestley Centre in time for lunch. After a briefing and introduction to the centre, it was time for the first activities, with an afternoon devoted to problem-solving and team-working exercises at the centre’s ingenious obstacle courses. Students had to scratch their heads to solve problems such as crossing a ‘gorge’ using only team work and three short planks, finding their way blindfolded, and passing eight team members through a ‘spider’s web’ without touching. All good fun and, along the way, everyone learned a bit more about communicating and what role they best play in teams. Everyone was tired on Monday night, but we got a camp fire going and chatted until dark. 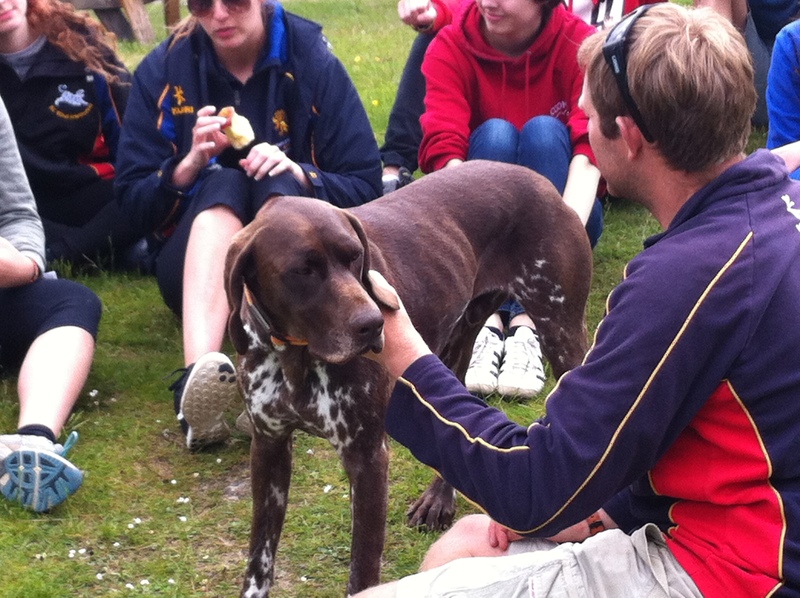 On Tuesday morning we went canoeing (a first time for some) and held a raft building competition. Two of the rafts made it around the course safely… and the third group swam out in some style. 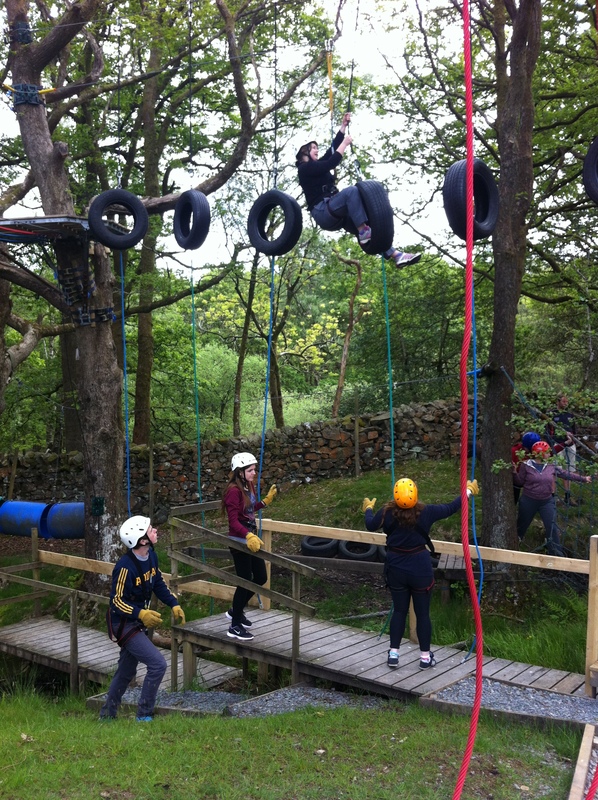 The afternoon saw us take on the centre’s dedicated ‘high ropes’ and ‘low ropes’ courses. Teamwork was crucial in getting everyone safely around the high ropes course (pretty high) and keeping them out of the mud besetting the low ropes course. 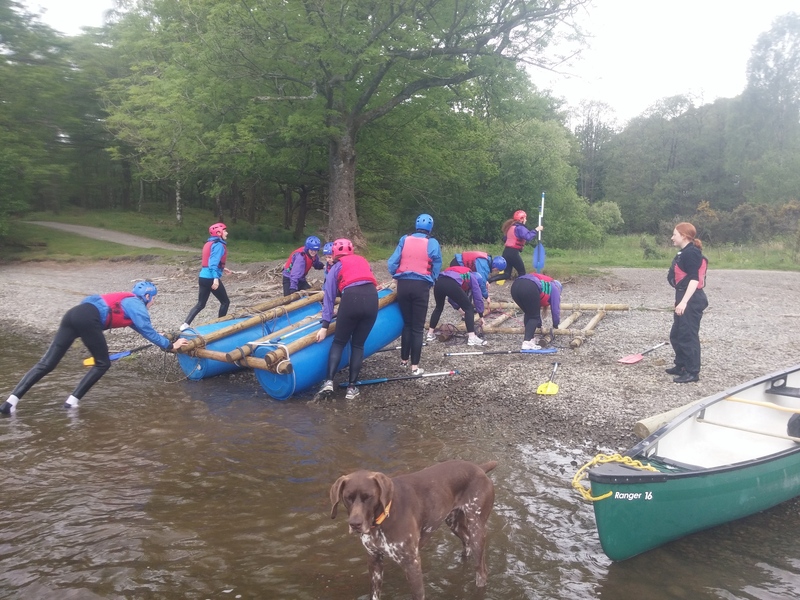 On the Wednesday, students took part in an all day project, working in teams, which involved map reading and orienteering, raft building and canoeing. The tasks required individual ingenuity and teamwork, plus the ability to acknowledge that different members of the group had different strengths which would each come into play in different situations. They spent the late afternoon working on their group reflective presentations for the Thursday morning — everyone took this seriously, and one group in particular put considerable creative effort into planning their presentation (set to the music of Bohemian Rhapsody). In the evening many of them went to the pub but all were back in the Centre in good time and in a reasonable state to return to work on Thursday morning! On the Thursday morning, students were surprised at having one more physical task to perform. In their groups they were each issued with a length of guttering and a tennis ball and had to manoeuvre the ball down the hill towards the lake without it dropping to the ground. Two of the three groups did this ok, one group did it eventually – with a little help from their friends as it were. Again it was a task about teamwork, leadership and esprit de corps…but maybe 8.30am was a little early in the day for some of the students. After the presentations the groups cleaned up their quarters and headed up the hill to catch the coach back to Birmingham. After the trip, all were agreed that Coniston was brilliant. Students came to know one another much better and say they felt much closer.